1. All employees at GamePoint and their immediate families are excluded from entering in any competitions on GamePoint. 2. After winning a competition at GamePoint you could be excluded from participating in another competition for a period of 3 months. 3. We require a minimum age of 18 years for participation in GamePoint events. Permission needs to be obtained from parent, guardian or trustee in case a young player wants to participate in GamePoint events. Participants need to be in possession of a permanent place of residence. 4. Possession of a valid travel document and a minimum age of 18 years is required for participation in GamePoint events where it is possible to win a trip. Unless otherwise agreed in writing; travel insurance, pocket money and food are on behalf of the winner. The departure date of travel is determined in consultation with the party that provides the travel. 5. Prizes will be announced before the start of the competition. All prizes will feature a short description. 6. All GamePoint prizes are personal and therefore not transferable. 7. Prizes that are won on GamePoint cannot be traded or exchanged for money. GamePoint reserves the right to refrain from handing out a gift when they feel there is a legitimate reason. 8. Winners will be notified within 10 days after the events closing date. 9. In case the prize consists of tickets for concerts, festivals, movies, sports or similar events, GamePoint cannot be held accountable for any form of compensation in case the event gets cancelled. 10. Game Point is not responsible for wrongly displayed information about the prize by advertisers and / or sponsors. 11. GamePoint is not responsible for possible malfuntions at the postcompany or other mail or courier companies (for example delay, strike or loss). In the case a prize is sent by registered mail but can not be handed to the winner of the prize or the partner/person present, and needs to be picked up at a later date by the prize winner (for example at the post office or post agency etc), GamePoint cannot be held responsible if the price is not picked up by the winner, even if there has been no notification or message left by PostNL or other mail or courier company, or if this notification or message has been lost or if it has been damaged in an unacceptable manner. 12. By participating in the promotions or contests at GamePoint you agree to these promotion conditions. When specific rules are formulated for certain promotions or contests, these will form an addition to the general promotion conditions. 13. GamePoint can change certain parts of these conditions for organisational or juridical/legal reasons without prior announcements or further explanation afterwards. 14. The data from participants in our events and / or contests may be stored in our database. GamePoint may use this data to contact participants and inform them of its activities. GamePoint will provide the correspondence in full compliance with applicable laws and regulations. The stored data will not be passed to third parties. 15. No correspondence is possible regarding the outcome of promotions or contests. The draws and announcements of winners are final. 16. GamePoint reserves the right to start and cancel online promotions at any random moment without notifications. This may include, but is not limited to: early bird promotions, double credit promotions and discount promotions. 17. When it is suspected that gift promotions, registration promotions etc are abused, GamePoint can and may withdraw gifts and take appropriate measures. 18. No monetary payment is required in order to receive the prize offered. 19. All game taxes will be paid by GamePoint. Prize winners do not have to pay tax afterwards. 20. GamePoint is not responsible for any typographical errors, technical failures, any form of discomfort that occurs during an action or any damages resulting therefrom. 21. Prizes need to be claimed within 2 weeks after the winner announcement. If the winner does not react within this time GamePoint holds the right to refrain from handing out the prize. 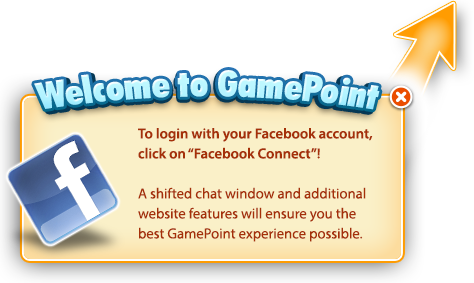 GamePoint is not responsible for wrongly filled in email addresses or home addresses filled in by our users.